"Glitch art is the practice of using digital or analogue errors for aesthetic purposes by either corrupting digital data or physically manipulating electronic devices." - Wiki. We love using glitches in graphic design and on the web. Here are some of our favourite tools and methods that we use to create stunning glitches. Photomosh is an absolutely awesome online tool which allows you to apply lots of different glitchy effects and even some standard photo effects like InstaColor. + We are truly impressed how much you can do with Photomosh, absolutely for free. - The app only has a desktop version. 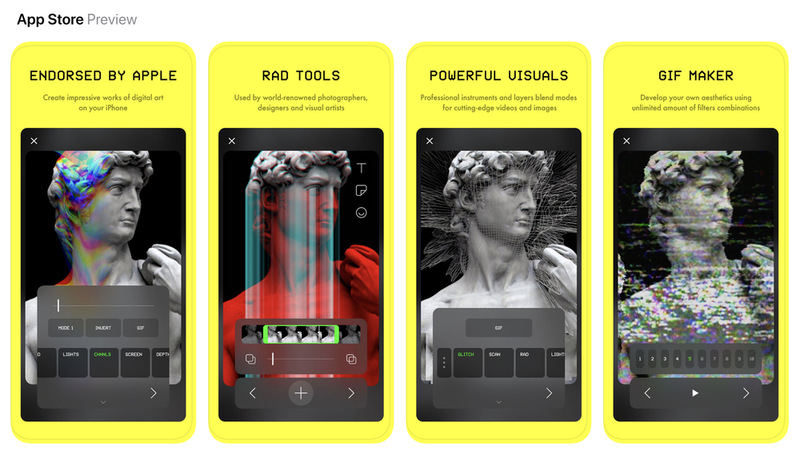 It is an ultimate tool for creating cutting-edge photo and video artistry. It's $0.99 in AppStore, 30.9 MB, Rating 3.6 of 5. + The app features a lot of amazing effects and it is very easy to use and share. Photo filters and "photo to gif" option are included in the basic price ($0.99). - Advanced features like video filters, camera filters and hi-res photo export shall be purchased for extra $2.99 p/feature. We found an article that explains step by step how to create a cool glitch photo effect using Photoshop, take a minute to check it out. + Professional high-resolution end result. - Needs advanced Photoshop skills and takes quite some time. With custom codes, the most amazing glitch effects can be created on the web as well. Check NCLUD website, one of the nicest examples of glitch art one can see on a corporate website.